SNMP stands for Simple Network Management Protocol, which is an Internet-standard protocol for collecting and organizing information about managed devices on IP networks and for modifying that information to change device behavior. If you use SNMP in your organization, you probably have an SNMP collector to gather information on the status of devices in your network. Since the NetBeez BeezKeeper is the central server for our network monitoring solution designed to provide an end-user experience view of your network, it would only make sense to be able to integrate it with your organization’s SNMP collector and receive any critical and performance alerts from your remote locations immediately, and be able to correlate them with other SNMP measurements/alerts. 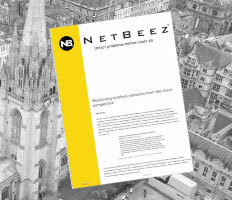 Since NetBeez provides a new and unique view of your network, we had to create our own set of SNMP traps to accommodate our data model and the types of alerts generated by our product. associated to alerts sent by the NetBeez BeezKeeper"
"First revision that includes only the alerts subtree"
The next step was to create a hierarchy of the objects that made sense to include in our MIB. First, we decided to create a child object right under the enterprise OID for the specific product: BeezKeeper. 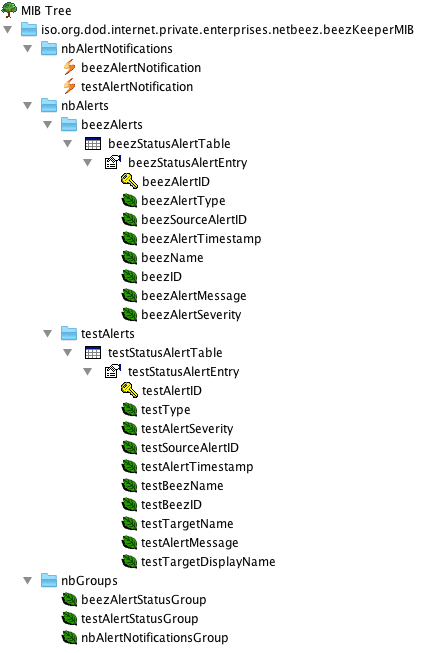 We then decided to include two table objects that will hold a SEQUENCE of the alert records for the two alert types: beezStatusAlerts and the testStatusAlerts. Doing it at this layer of the hierarchy gives us the ability to add more alert types if we need them in the future. alerts triggered by the NetBeez BeezKeeper." "A notification about a change in the alert status of a beez agent." "A notification about a change in the alert status of a monitoring test." This is the design we iteratively came up with. There may be some redundancies, or non-standard things in there, but this was all done by trial and error, and any feedback or discussion on this is always welcome. Of course, SNMP works great if your organization is using SNMP as their primary way of looking into the status of network devices. Otherwise, you could also integrate the NetBeez BeezKeeper alerts using our Syslog integration.